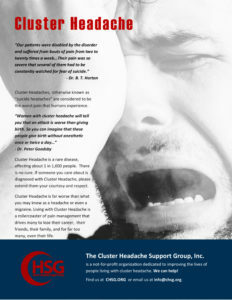 There is just enough awareness about cluster headache and other headache disorders to prompt volumes of bad information to spread all over the internet, bookstores, and mainstream media outlets. It seems as though everyone is out to make a quick buck off the suffering and desperation of hurting patients. You’ve likely run across dramatic claims of “cures” such as ear piercings, soaking your feet in hot water, drinking lemon juice and salt water, purple lemonade, or green smoothies. With so much information out there, how will you ever know what is accurate? Do reliable sources even exist? Yes, they do. Almost all of it is free and it’s all available online for anyone to access. If you ever read something on or offline that sounds questionable, suspect, fishy, or too good to be true, use these resources to get the facts. While not a complete list, this list includes some of the country’s leading headache experts and organizations. These are not bloggers or companies with something to sell. If you want to know what’s happening in the world of headache medicine, these are the ones to follow. They are listed in alphabetical order, not necessarily in order of importance. Patient-Centered Outcomes Research Institute is dedicated to improving the quality and relevance of evidence available to help patients, caregivers, clinicians, employers, insurers, and policy makers make informed health decisions. Our goal is to provide you with accurate, reliable, truthful, scientifically-backed information every single time. We are dedicated to accurate, reliable, trustworthy information about cluster headache, other TACs, and all headache disorders.